Stress is defined as the force per unit area and strain is the fractional change in length, area or volume. Obviously, this is the resistance of the body to deformation due to the application of external force. Obviously, stress is the intensity of internal force. 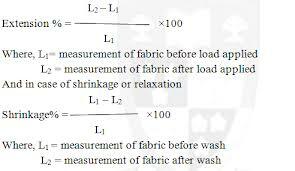 The stress is said to be normal if load p is normal to the surface and tangential or shearing, if load is tangential to this surface. The normal or direct(tensile or compressive) stress is produced over a section when force is acting normal to the section. If the force is acting away from the section, the stress is tensile, if it is acting towards the section the section is compressive. (iii) The direction in which stress is acting. Strain is simply a ratio and has no unit and it is a dimensionless quantity. Depending upon the type of load, strain can be lateral strain or shear strain. The strain associated with the change in length is called the elongation strain (l/L).Similarly v/V is the volumetric strain, where V is the volume. When there is a change in shape and no change in volume, corresponding strain is called shear strain. The shear strain is measured by the angle. The behavior of a material within the elastic limit is the same under compression as under tension. (a) Elastic strain: It is the change in dimension of a body when it is subjected to a load. This is reversible phenomenon, i.e., elastic strain disappears after the applied load is removed. This is proportional to the stress applied. (b) Plastic strain: This is the permanent change in the body when subjected to a load. The change remains even after the applied load is removed.